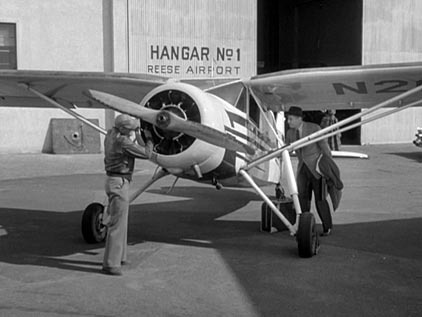 Officially named the Lockheed Air Terminal at the time of the series, I suspect it was always called the Burbank Airport by the locals. It's had several names and owners since it opened in 1930. Since 2003, it's been the Bob Hope Airport. Read more about it at the airport site. Seen in at least episodes #39, 99, 165, 220 and #258. Note the similarity of the two pictures above. 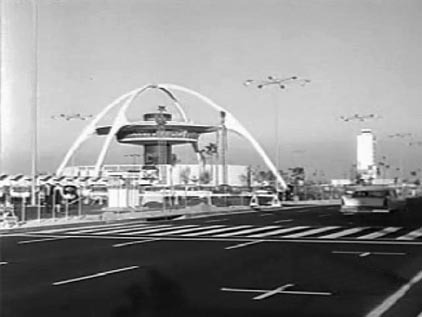 It appears that the same scan and pause establishing shot was used in most of the episodes where this airport appeared. At least in #99, #165 (trimmed a bit on return from a commercial) and #220. A composite image from a vertical pan shot in episode #39. 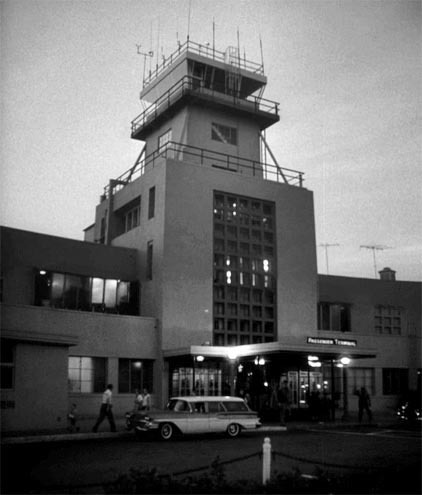 This airport opened as Mines Field in 1930 and was ultimately renamed the Los Angeles International Airport in 1949. The distinctive "Theme Building" was built in 1961. 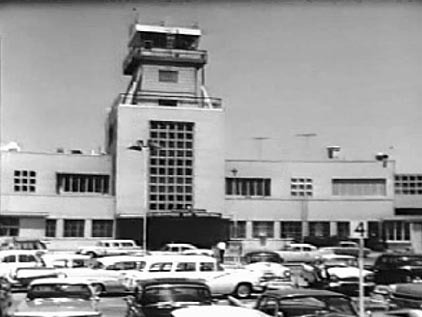 The airport is seen in two ways in the series. 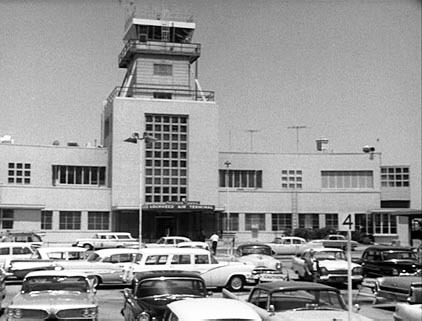 Earlier episodes feature some of the "temporary" terminal buildings from the late 1940s near the corner of Airport Blvd. and Avion Drive in a tracking shot of Paul Drake driving. This sequence is seen in episodes #96 and #123. Later episodes show the spiffy new theme building. This location is seen in episodes #177, #178, #198 and #264. From #96, the "old" passenger terminals. This scene is also used in #123. From #178, a view of he distinctive white "Theme Building." A 2006 view courtesy the Wikipedia. Seen in episode #123, TCOT Guilty Clients. 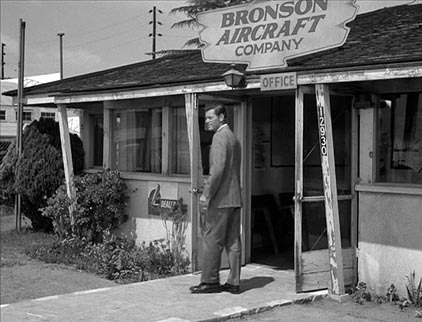 Eric Cooper, familiar with the area, deduced, from the 12930 number on the Bronson Aircraft Company shack, that this location must be the Whiteman Airport near 12930 Pierce Street in Pacoima. 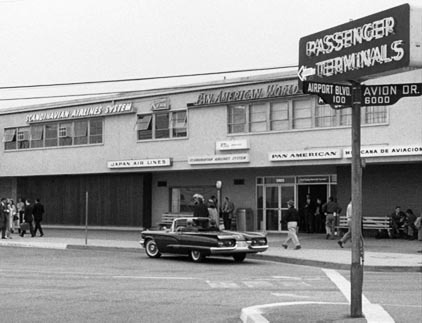 Oddly enough, some research at the Newspaper Archive, reveals that 12930 Pierce Street, Pacoima, was the address of the Whiteman Airport in 1961 when this episode aired! 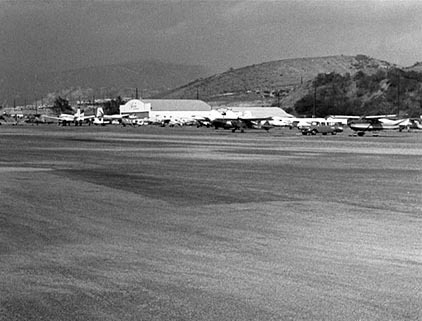 Known as the Whiteman Air Park during the time of the series, it was purchased by Los Angeles County in 1970 and renamed Whiteman Airport. Read more about the airport here. From #123, the Bronson Aircraft Company shack. Could this be the original headquarters of the Whiteman Air Park? From #123, a view across the dirt runway. 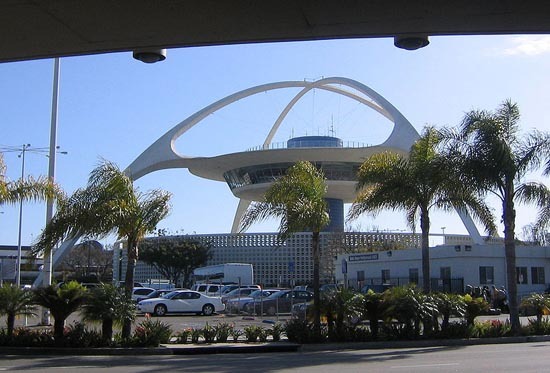 This presumably fictional airport is the location a some critical action in episode #22, TCOT Fugitive Nurse. Could that be the big hangar at Whiteman Airport seen above? This is about all that's seen. Nice plane.